Kickass, the doorstop dog, says he is among the dogs contacted by the White House to eat the Mueller report once it is released. 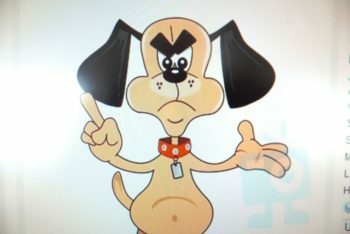 The Oval Office said in part: “Since it has been a long respected alibi used by school boys for incomplete homework assignments, the president is recruiting dogs willing to eat the Mueller report so the president can tell the American public that “the dog ate it,” which would allow him to tell the truth, for once.” It is not clear which White House staffers were involved in the dog-recruiting memo, but Sarah Huckabee Sanders told a subsequent press gathering that any brave dog volunteering to eat the Mueller report would be provided with free neutering and guaranteed a life of ease in a Federal dog pound. Kickass said in response to the White House message that it would be better for the White House to try to recruit cats to bury the Mueller report in the White House litter box, which must be gigantic by now, considering the president’s well-known use of a feline term in expressing his technique for relating to females.